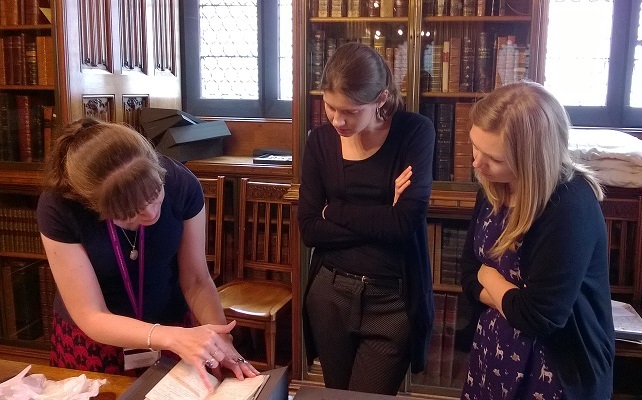 Following our visit earlier this year to the Guardian News and Media (GNM) Archive, we were happy to host a return visit by Acting Head of the GNM Archive, Philippa Mole, and Archive Trainee, Helen Swainger. Philippa and Helen are based at the GNM HQ in London’s King’s Cross. Material in the GNM archive dates largely from 1971, the year that the Guardian newspaper moved the bulk of its operations from Manchester to London. It was also the year that the archive of the newspaper, dating from its inception in 1821 up until 1971, was acquired by John Rylands Library as a gift from the Guardian. Yesterday’s visit was designed to facilitate knowledge sharing about the two Guardian archive collections and to open up discussions around partnership working. We were interested to hear that plans are already being made for the celebration of the bi-centenary of the Guardian in 2021; and that the Guardian archive in London had recently acquired owner/editor C.P. Scott’s desk which was originally located in the Manchester office. l to r: Fran Baker, Philippa Mole and Helen Swainger examine the Peterloo relief fund account book. Photograph by Jane Speller. After taking our visitors on a tour of the Library, we went behind the scenes to show them some treasures from the John Rylands’ collections. These included Elizabeth Gaskell’s original manuscript for her biography of Charlotte Brontë, William Caxton’s English-French dictionary (an aid for merchants travelling abroad) dating from the late fifteenth century, and Queen Victoria’s glove. The glove is one of the curios from the Isabella and Linnaeus Banks Collection (part of the E.L. Burney Collection). Philippa and Helen were fascinated to see the Peterloo relief fund account book which records payments made to the injured and the families of the dead, resulting from the Peterloo Massacre on 16 August 1819. Peterloo was one of the catalysts for the launching of the Manchester Guardian. The paper was intended as a mouthpiece for liberal voices in Manchester. 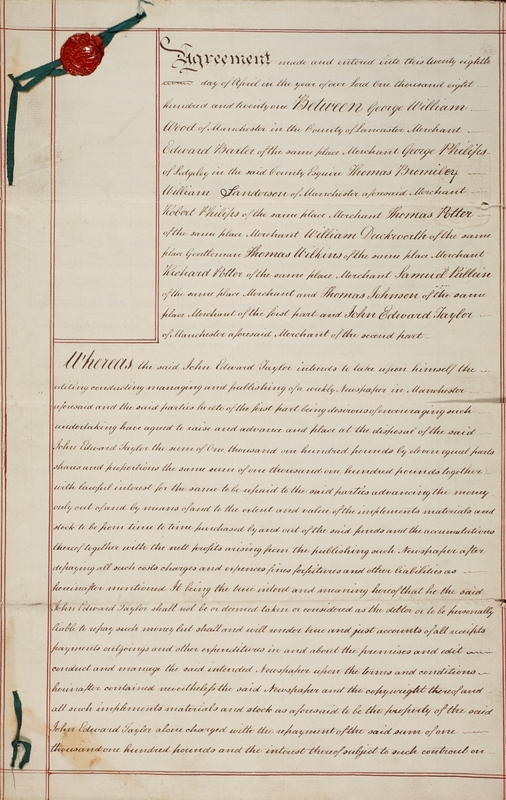 Treasures from the Manchester Guardian Archive included the 1821 Prospectus which set out the ideals of the newspaper and the 1821 Agreement signed by John Edward Taylor (1791-1844) and the other founders of the paper. The agreement promised that the founders’ investments would be returned should the paper fail. Agreement between J.E. Taylor and a group of Manchester merchants and gentlemen for financing the launch of the newspaper in 1821. Guardian Archive, GDN/260/4. Reproduced courtesy of Guardian News and Media Ltd.
We also looked at the wonderful Manchester Guardian centenary album which was presented to owner/editor C.P. Scott (1844-1932) in 1921. 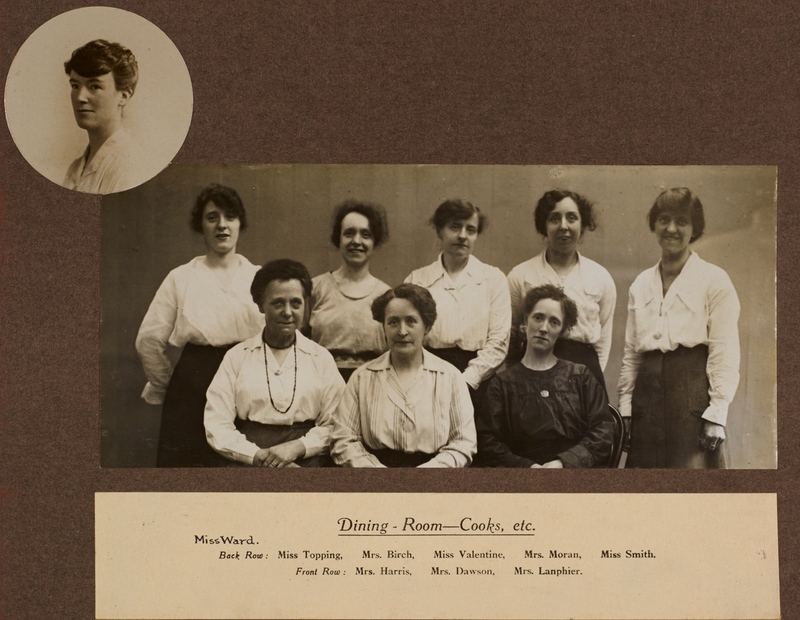 The photographs in the album were taken by staff photographer Walter Doughty (1876-1958) and each page features a different department of the paper, from editors and sub-editors, to secretaries, porters, stable boys, cooks, and cleaners. Every member of staff is named, and anyone who was absent on the day of the shoot was photographed later and pasted in. The album is a complete record of the 500-odd people who worked for the newspaper at that time. 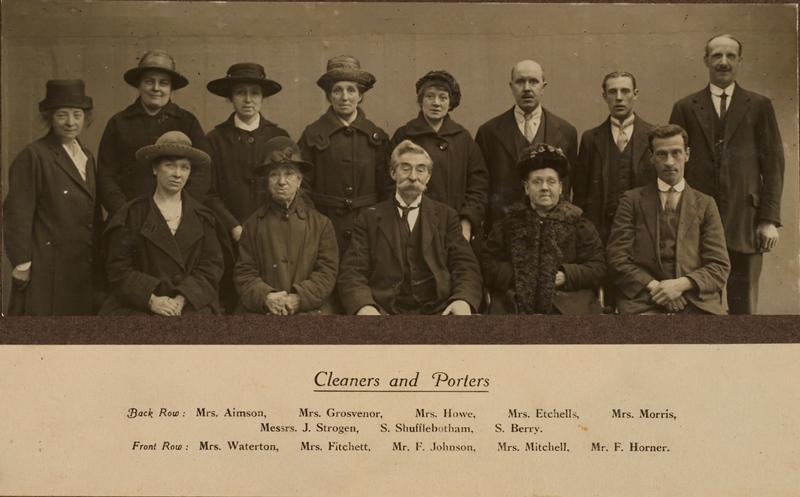 Manchester Guardian cleaners and porters dressed in their Sunday best, 1921. Guardian Archive, GDN/140/2. Reproduced courtesy of Guardian News and Media Ltd.
Manchester Guardian dining-room staff and cooks, 1921. Guardian Archive, GDN/140/2. Reproduced courtesy of Guardian News and Media Ltd.
We look forward to forging closer links with our Guardian archive colleagues in the future. The visitors’ book of The John Rylands Library contains the names of thousands of people who have visited the Rylands since 1899. There are many surprises in the volume – signatures that one does not expect to see. One such visitor in July 1957 was the American Nobel laureate John Steinbeck, author of some of the twentieth century’s most famous novels, including Grapes of Wrath and Of Mice and Men. One would expect Steinbeck’s visit to have been a high-profile public event, but in fact he came to the Rylands in a private capacity. Why he came, what he saw and the influence that this had over Steinbeck’s writing is one of the untold stories of The John Rylands Library. Page from the visitors’ book of the John Rylands Library showing the signatures of John Steinbeck and his wife Elaine, 19 July 1957. Steinbeck was passionately interested in Arthurian myth and many of his works show the subliminal influence of the medieval romantic style. In 1956 Steinbeck and his wife moved to England, to a cottage near Glastonbury, in order to conduct personal research into Arthurian texts and use that experience to take his writing in a different direction. 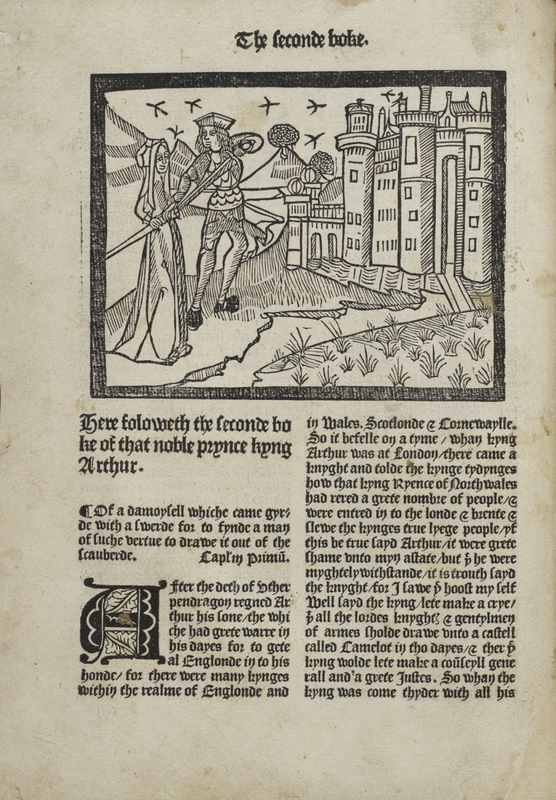 Image from Le Morte d’Arthur by Thomas Malory, printed by William Caxton in 1485. 18930. Image from Le Morte d’Arthur by Thomas Malory, printed by Wynkyn de Worde in 1498. 15396. 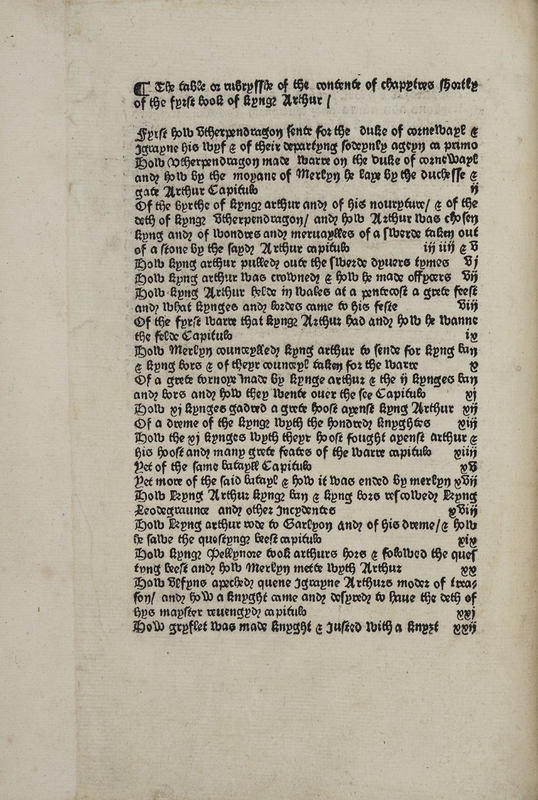 The Rylands also has a 1498 edition of the same work from the press of another early English printer, Wynkyn de Worde, and this copy is unique. It was these books that John Steinbeck came to Manchester to see, almost as a form of literary pilgrimage. His research into Malory had a practical aspect – it influenced the style of his satirical novel The Short Reign of Pippin IV, published in 1957. Despite the muted critical and popular response to Pippin, Steinbeck continued to draw heavily on Malory for inspiration. At the time of his death in 1968, he was working on a re-writing of the story of King Arthur, which was published posthumously as The Acts of King Arthur and His Noble Knights (1976). 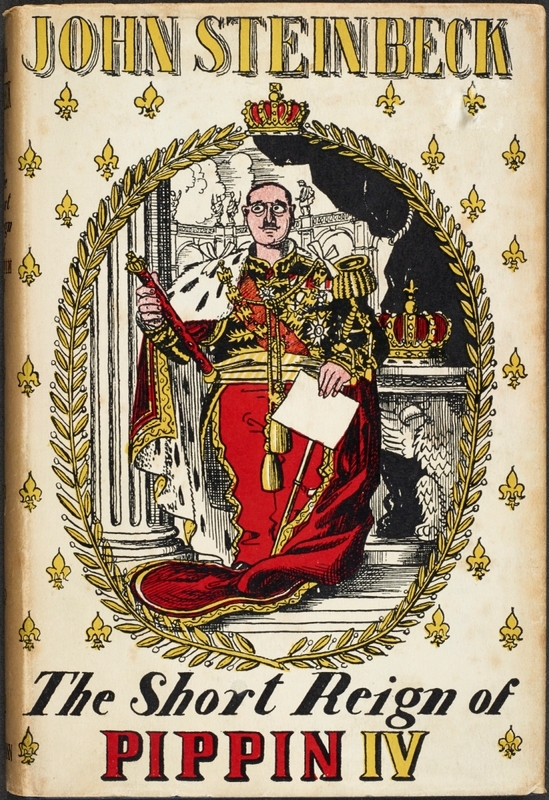 Dust jacket of The Short Reign of Pippin IV, first UK edition (London: Heinemann 1957). The experience of travelling around England and researching the works of Thomas Malory meant a great deal to Steinbeck on a personal level. During his final illness, he told his wife that he considered the happiest period of their lives together to have been the year spent in England researching the basis for his literary inspiration. John Steinbeck’s connection with the John Rylands Library is in one sense a footnote in the story of his life; his visit was personal in nature and was quickly forgotten. But this is one of the intriguing aspects of the story – Steinbeck came to the library, not as a distinguished visitor, but as a reader and in so doing illustrates the deeper and more meaningful connection between writers, readers and institutions like the John Rylands Library. Quoted by Jackson J. Benson, The True Adventures of John Steinbeck, Writer (Heinemann: London, 1984), pp.20-21.